So how different would the third X-Force series be 17 years after the first original X-Force #1 comic book came out? Well, there's a little more blood and a little less team members. The original X-Force was a group of young mutants, formerly the New Mutants, lead by the experienced military mutant from the future, Cable. The new team also has an elder mutant leader, but one with a little less grey hair and a little more hair in general. 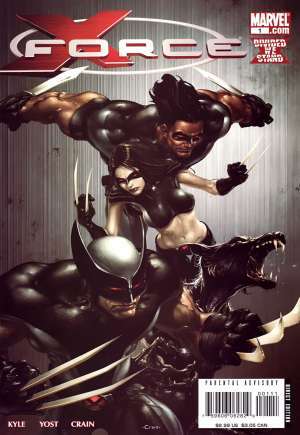 Wolverine leads a team of three consisting of himself, X-23 and Warpath. All three have claw like weapons (Warpath has 2 vibranium knives, and Wolverine and X-23 have adamantium claws) and all three are down to kill a lot of people to protect mutants. The X-Force of now has been assembled as a hit squad by Cyclops. The regular X-Men cannot be involved in murder no matter how bad the bad guys are; but, Wolverine has already killed enough people that another hundred to thousand won't affect his conscious one way or another, X-23 is a trained killer so it's nothing new to her, and Warpath seems to be the young mutant turned man looking to impress the old veterans Wolverine and even Cyclops to an extent. I think the new comic of the day, X-Force #1, really captures the essence of who Wolverine is years after his many experiences with the X-Men. Wolverine is supposed to be the best at what he does, but in so many comic books Wolverine is always getting beat-up and knocked around; however, X-Force (volume 3) captures the ruthlessness of Wolverine when he is in pure destruction mode. Maybe he is holding back in other books because he is around the other more innocent X-Men, but in X-Force, Wolverine just straight up brutally kills anyone he deems evil...and I like that.